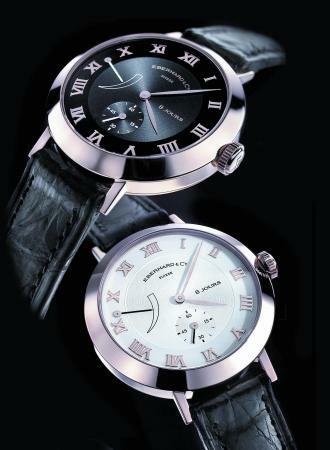 The Eberhard “8 Jours” collection has been expanded with an elegant model in rose gold. Movement is a hand-wound mechanical (base Peseux 7001). Functions are hours, minutes, seconds, and power reserve. The case is in 18kt rose gold with a cambered sapphire crystal. Dials are available in white or black with rose gold appliqué Roman numerals.